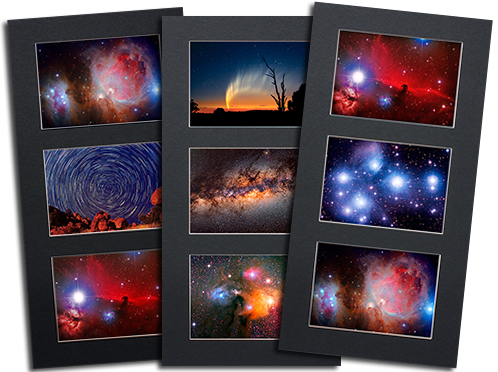 Three individual handpicked 5 x 7-inch photographs are professionally mounted on a 505x250mm backing board with a black border mat. Ready for framing or display. Descriptive labels on the reverse and signed by the photographer. Top: Comet McNaught over Barrington Tops National Park. 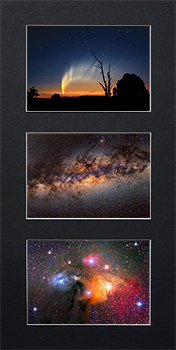 Middle: The Milky Way from Outback Australia. Bottom: Rho Ophiuchus Nebula in Scorpio. 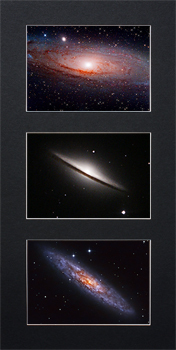 Top: Sombrero Galaxy in Virgo. Middle: Andromeda Galaxy in Andromeda. Bottom: Silver Coin Galaxy in Sculptor. Top: Horsehead Nebula in Orion. 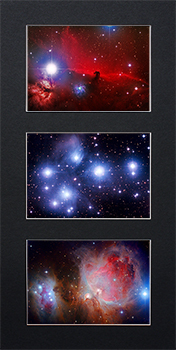 Middle: Pleiades Star Cluster in Taurus. Bottom: Orion Nebula in Orion.